For those eager to easily misplace two terabytes worth of photos, videos, MP3s, and other important documents, today Kingston unveiled a three-inch USB flash drive packing more storage than even a fully spec'd MacBook Pro. The Kingston DataTraveler Ultimate Generation Terabyte (GT) flash drive isn't exactly tiny, but compared to the external backup drive sitting on your desk, it's probably considerably more pocket-friendly and easy to travel with. 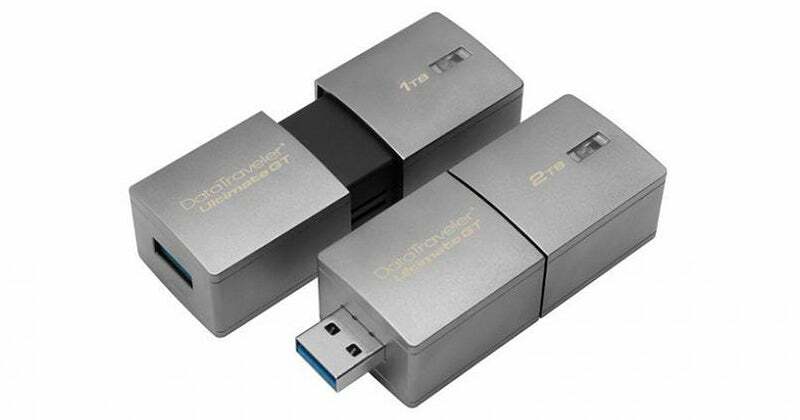 When eventually available the USB 3.0 drive will presumably arrive with an equally massive price tag, but those two terabytes of storage also come wrapped in a tough zinc-alloy metal casing that can survive sub-zero temperatures all the way down to 4 below zero, and protect your data all the way to up to a toasty 85 degrees Celcius. But all that armour won't protect a single byte of data if you lose it. So sad that this USB 3.0 drive is only available for macbooks specifically and not the common windows PC, oh well. Where does it state" specifically for mac"? What makes you say that? It looks like a regular USB to me meaning it wouldn't plug straight into a new mac but should work on every Windows PC? Whats stopping you from using it in a Windows based PC? I see no mention of it being exclusive to Mac.